Ralph McQuarrie, the designer behind the famous Star Wars character Darth Vader died at age of 82 in his home at Berkely, California. If it's not for him Star Wars would not be possible through his creative mind to put up a realistic alien invader, his works will remain on us through times. Among his works are R2-D2, C-3PO and Chewbacca. McQuarrie also won an Academy Award for visual effects for his work on 1985's Cocoon. 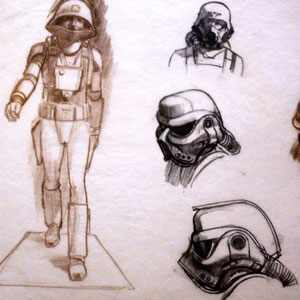 In addition to Star Wars, McQuarrie also worked on the original Battlestar Galactica TV show and the films E.T. the Extra-Terrestrial and Close Encounters of the Third Kind in 1978.
not really a fan of starwars but i know that it's one of the greatest fantasy movies of all time.. and Ralph McQuarrie is one genius that will never be forgotten. Ang cute naman ng mga robots :) Sad to hear nga lang about the death of the designer..
His works will remain in our hearts forever! Sad to hear the news... but all start need to ends well. I do hope that he leaves a fortune to his followers/fans. Aww man, sayang siya, being a star wars fan (not die hard though) this news made me sad. He has done some very memorable design and with star wars, his legacy would live on with star wars. Can't believe dead na. :( Pero his works will live on! Kudos to Mr. McQuarrie..kumpleto ako ng Star Wars but haven't seen all the movies yet. He's a great designer. When I first heard the news, I was like, awwwww. Mr. McQuarrie sure left a huge footmark in film history. Not a fan of Star Wars. But I know lots of people who will grieve because of his demise. he was a visionary, well ahead of his time. he will surely be missed..
fan of star wars (but not a fanatic)...didn't know the designer was 82, RIP Ralph! He is a big loss to the Hollywood movie industry. not really a fan but interesting to know. uhm, Chewbacca looks like Ewoks? san na nga ba si Ewok?! Sad news.. But he died at a ripe old age. And him being part of an EPIC STAR WARS SAGA, his works will live on. Only heard his name when he died. Sad story that many are still unrecognized for their vital contributions. He was an innovator, and paved the way for other artist in the same field with his success. OMG :( This is a sad news. But for sure, his legacy will live on.